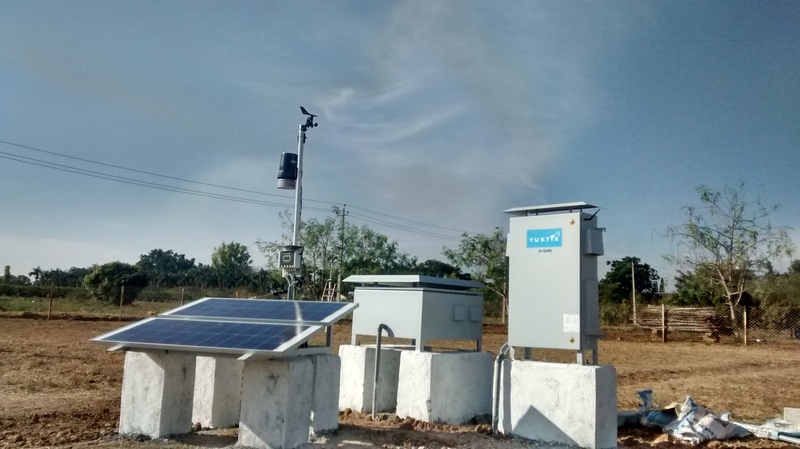 Digitizing Indian Agriculture Institutes - Using Yuktix IOT platform - Part 2 - Installation. 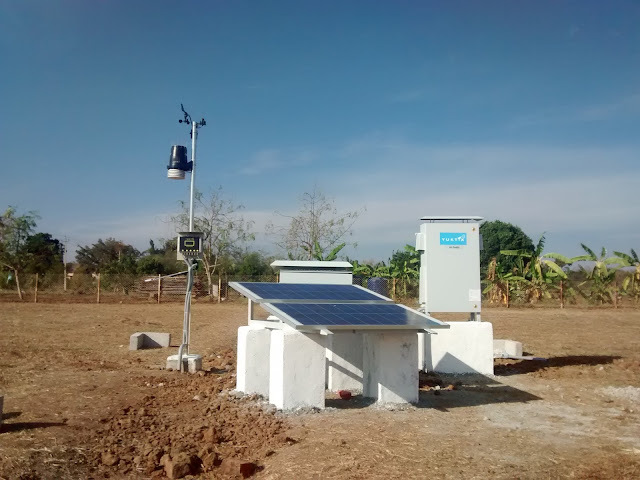 Today, Yuktix team finished up installing off-grid, solar powered Automatic Weather station and Air quality station at one of the Agricultural institute based out of Bangalore. In all, there are net 16 sensor installed in the site and it is 1st of its kind of installation by Yuktix Technologies. Along with Automatic Weather Station and Air Quality Station, a quad-copter fitted with a wireless camera is also supplied to the institute. 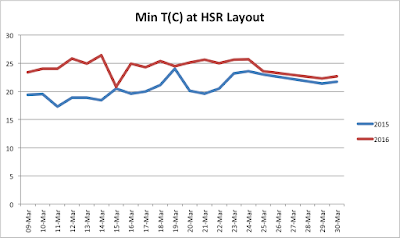 There is further talk of how to effectively use the live feed of wireless camera in generating NDVI imagery which can be very useful for a agriculture institute in knowing the "greenness" or photosynthetic activity. In our last blog, we talked about how we are digitizing Indian Agriculture institutes with Yuktix IOT platform. 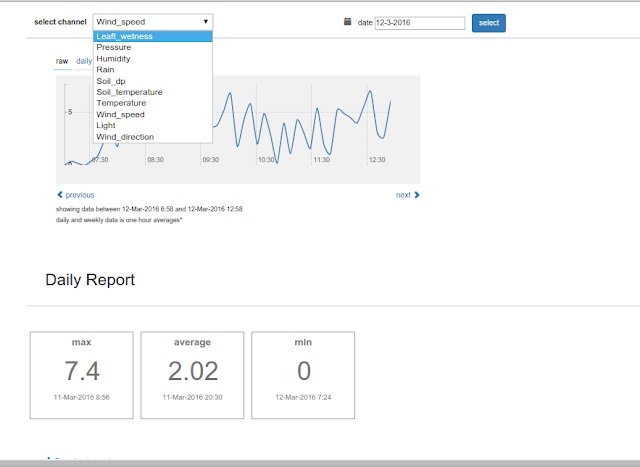 For any IoT platform, data capturing from the physical environment is one of the major part and that is done using multiple available communication options. In our case we have use GPRS for posting captured data from the environment to the Yuktix Cloud. Below is small pictorial description of how we do that. Below are some of the photos of our present installation. For part 6 hour in raw format. 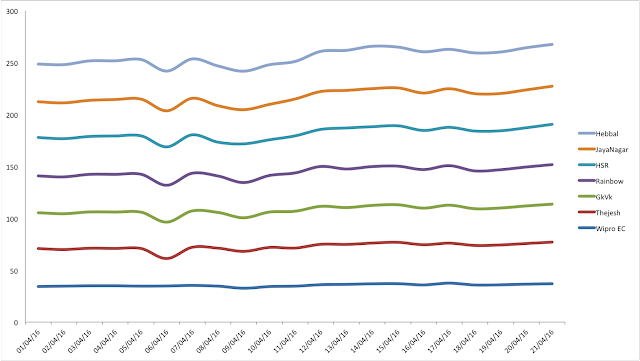 You can even scroll and see the past data. 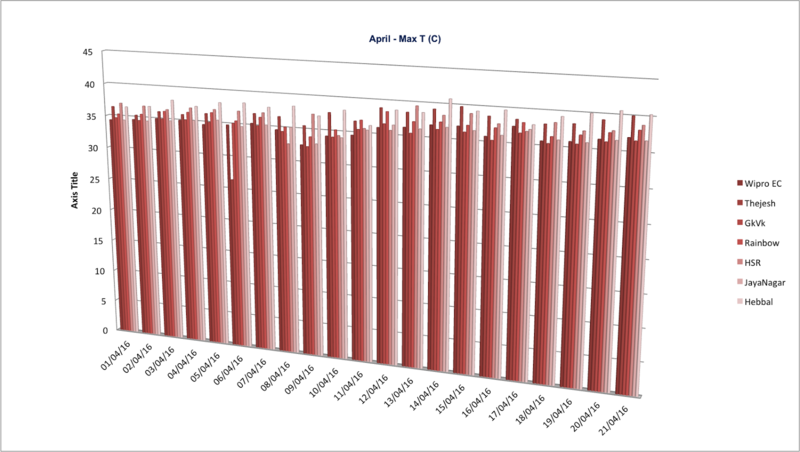 We even provide the raw data stored in our archive, so if any researcher is interested to do his/her research, he can use raw data available in .xlxs format or .csv format. We even have public and private API's, which can be used to fetch data from our server and thus any one can use our data. Data from our servers can also be ported to other clouds, so there is no data silos. There are lot of other features of Yuktix cloud, which we will be discussing in our other blog. Along with all above mentioned features of Yuktix IOT platform, Yuktix Android application is yet another important feature. 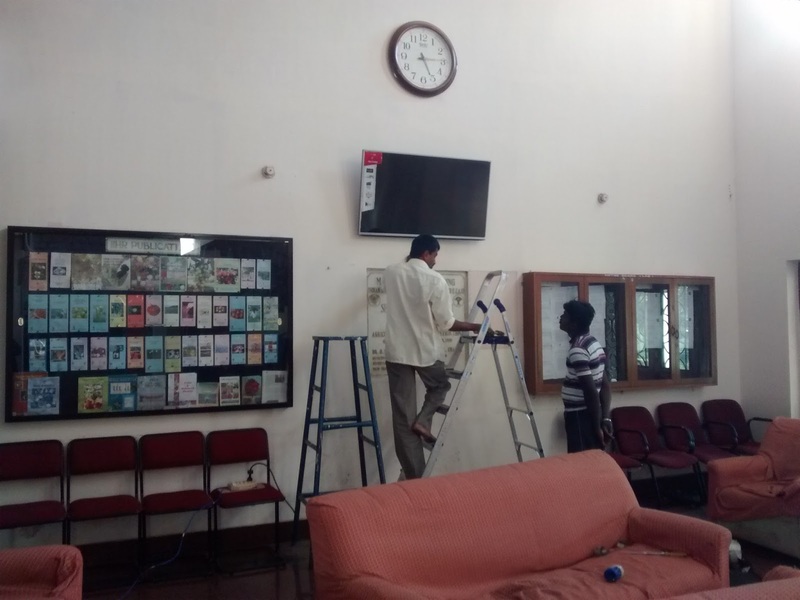 In our present installation, we have used Android OTT to deploy our application in the institute and institute has become one of first of its kind of Institute to use such technology to display weather related information in real time in their premises. Below are some of the pics while we were testing the OTT box in our office and while we were installing the TV in institute premise. And this is how, we at Yuktix Technologies provide end-to-end complete IoT solution for Indian Agricultural Institutes, so that they can get data in their office in real time without putting much of the effort. For more information on the project, you can drop us a mail at support@yuktix.com or shailendra@yuktix.com. Digitizing Indian Agriculture Institutes - Using Yuktix IOT platform. 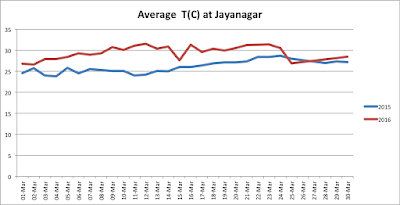 During our first visit to one of Agriculture institutes based out of Bangalore, we were told a problem which they were facing in getting access to the Automatic Weather station data from the servers. Their Automatic Weather Station use K-band satellite communication. (1) Process take a long time to access the archive of past data. (3) No analysis of data. (4) No customization as per their needs. (5) Data aggregation is a problem. And thus they were based on a manual weather station observatory. They use to take 2 readings per day, share the same reading with IMD (Indian Meteorological department), get the weather forecast and share the weather forecast with the farmers. 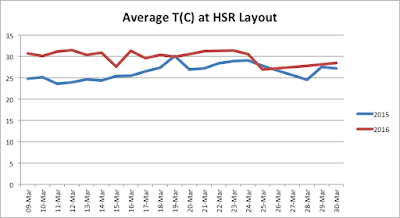 And problem with taking 2 readings in the day is that there is lot of variation of weather parameters during the whole day, increasing frequency of data capturing can resolve the problem. This is where Yuktix Automatic Weather Station come into action. We started developing Automatic Weather stations around Yuktix IOT platform for a weather enthusiasts based out of Bangalore facing the same problem of getting access to weather data from IMD. 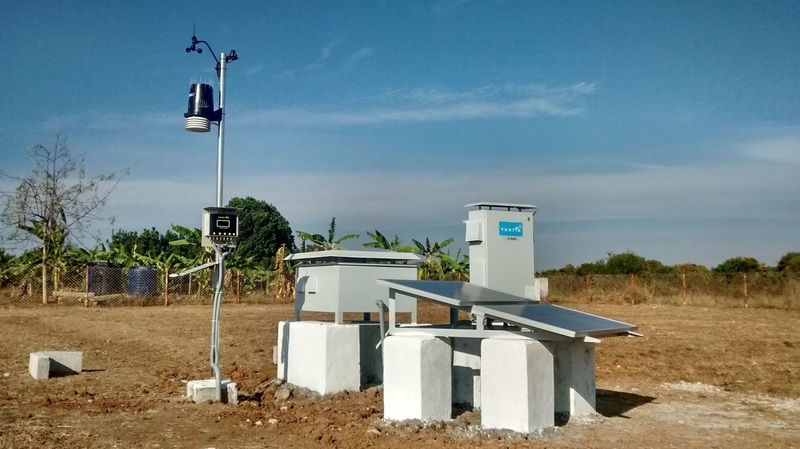 The project was named as Bangalore Open weather project. You can access the same www.yuktix.com/m/aws . You can read more about the project at Knowyourclimate blog and at this link. 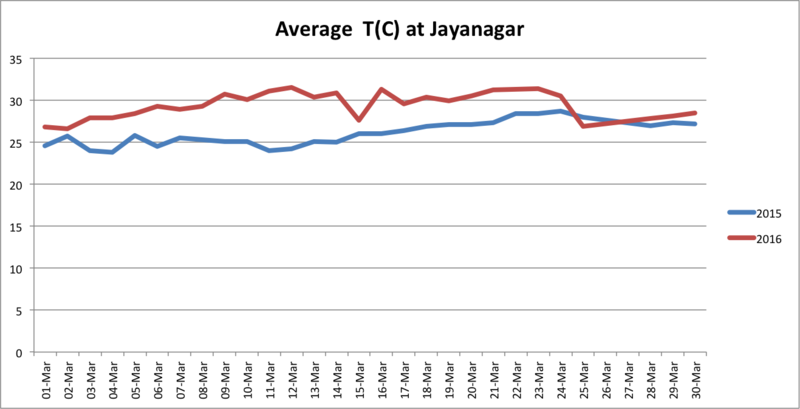 At present we are running 18 weather stations in Bangalore and Mysore. 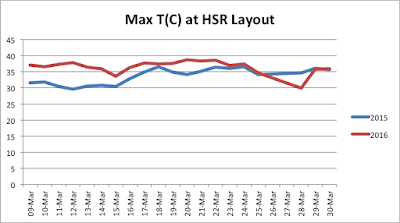 We deployed fully solar power Automatic Weather station at the same institute with 10 sensor. Yuktix Automatic Weather station, sample environment data after every 15 second, take a average and send it to server after every 3 minutes, thus not missing even the smallest change in the weather. (1) Now without going to observatory in person, they now get the real time data on their screen. (2) They can get access to the raw data from Yuktix Archive for their research. 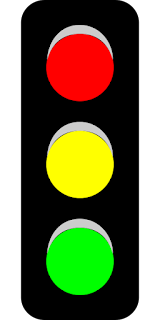 (3) Customization is easily possible on what to show and what not to. 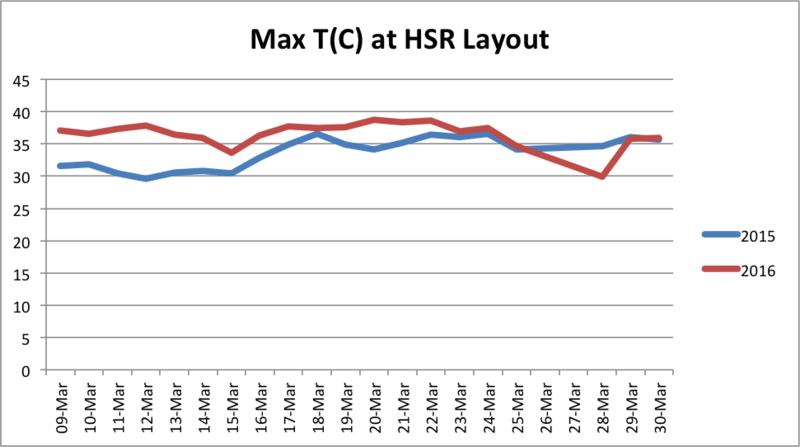 (4) Analysis of received data, like hourly average, Daily average, Mix, Max and Average is possible. 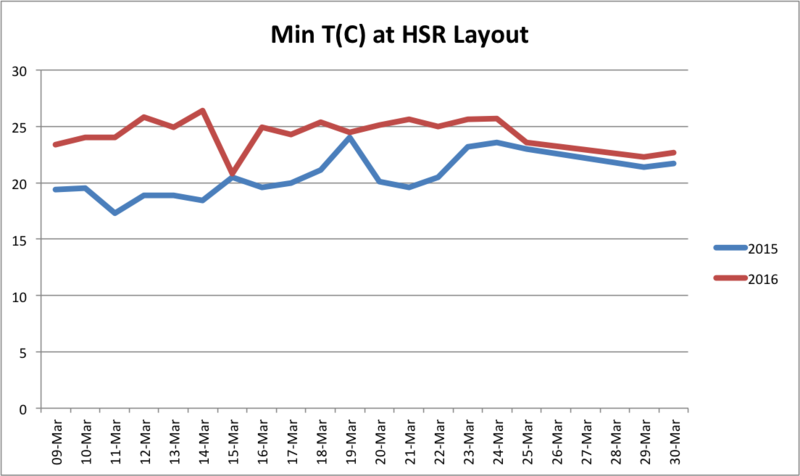 (5) Data is displayed using Graphs for last 6 hour, last day, last week. You can read more about Yuktix Cloud features at this link. 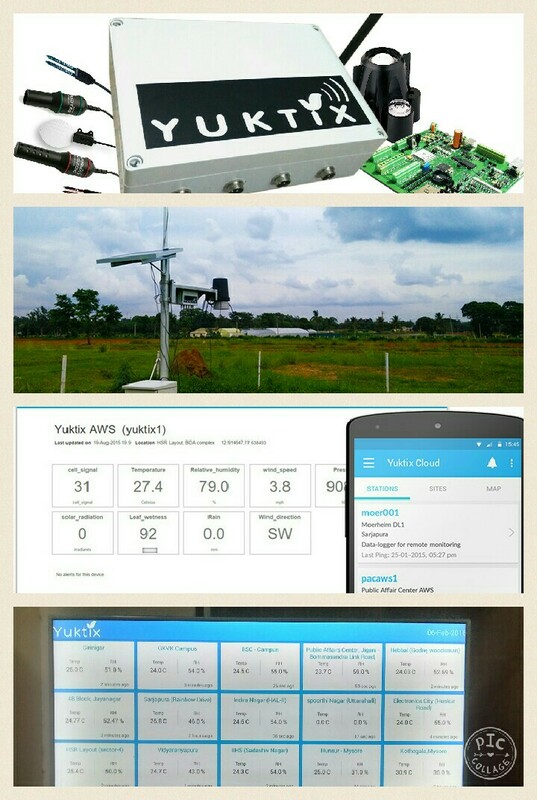 The best part of Yuktix Automatic Weather station is that it's a complete package of Hardware (Data acquisition unit and sensors) , Cloud server (Yuktix Cloud), Web-app (Yuktix Web app) and Android application (Yuktix Android application). 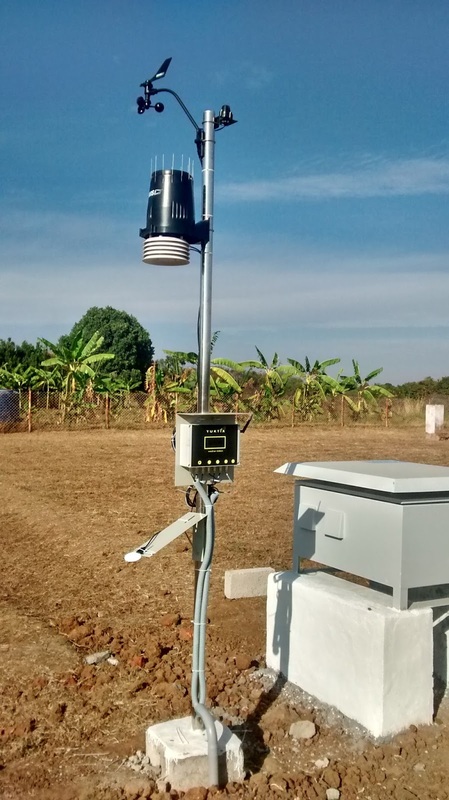 We have developed a new application for one of the premier Agriculture research institute based out of Bangalore and very soon we are going to deploy a set-up of 15 sensor in their campus. So this is how we are going to digitize the process of data capturing, analysis and display using Yuktix complete IOT platform. 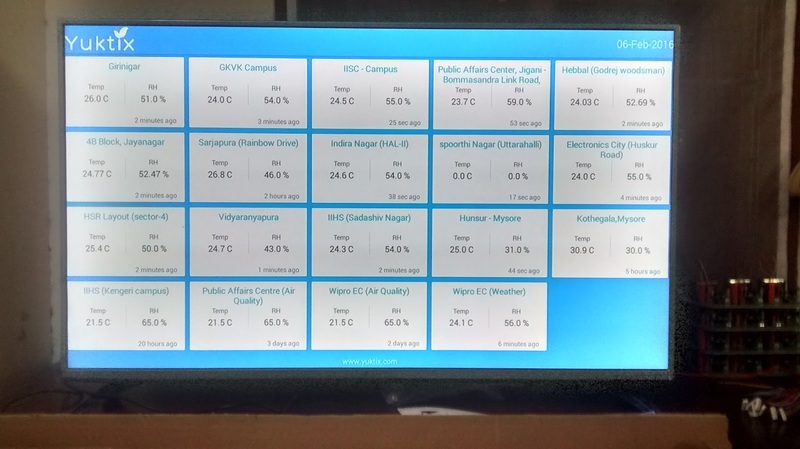 Below is the image of android app displaying all the stations on a 49" LCD TV. 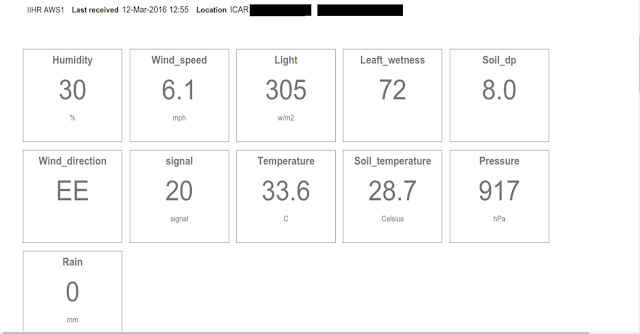 Yuktix is using the same IOT platform in the field of environmental monitoring (Air quality) for smart cities, Greenhouse internal environment monitoring and in different other fields of Agriculture. This is second article in the series of articles Yuktix is publishing on air quality. 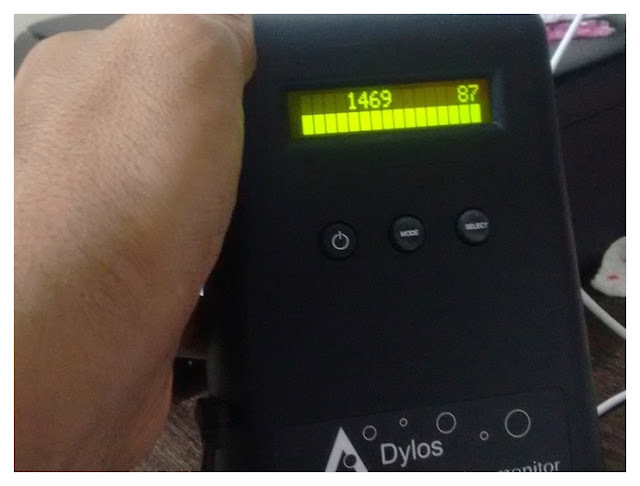 First part of this series looked at the requirements of measuring air quality in Indian cities. We tried to answer why we should measure air quality and how we can develop a plan to do so on a budget. 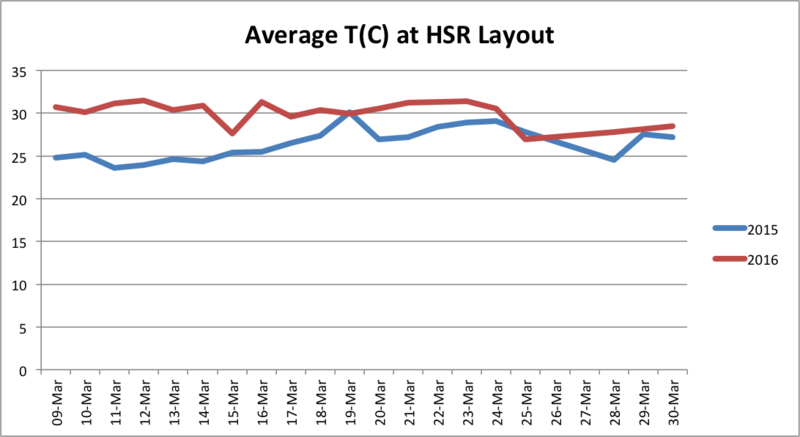 Here in this article, we look at what variables to measure and what comprises air quality index and how we should report and interpret it. The best place to look for information related to air quality is US environment protection agency (referred to as EPA in this article). There are many gases and different types of particles present in the environment around us. Most can have harmful effect on humans in higher/lower concentrations so it is important to know what we want to measure under ordinary circumstances, e.g. when we are walking on the road or sitting on porch sipping coffee. The EPA site has a wealth of information and there is no point in repeating that here. EPA site also has AQI calculators, sources of pollution and their effect on humans. The ministry of Environment, Forest and climate change links to an IIT Kanpur website that of course, does not work so we are trusting the Wikipedia link. We first quickly summarize the risk of individual pollutant on humans, their possible sources and then move on to AQI. Carbon monoxide (CO) is a colorless, odorless gas emitted from combustion processes. Nationally and, particularly in urban areas, the majority of CO emissions to ambient air come from mobile sources. It forms when carbon in the fuel does not completely burn. CO can cause harmful health effects by reducing oxygen delivery to the body's organs (like the heart and brain) and tissues. CO can cause issues with mental alertness and vision. At extremely high levels, CO can cause death. 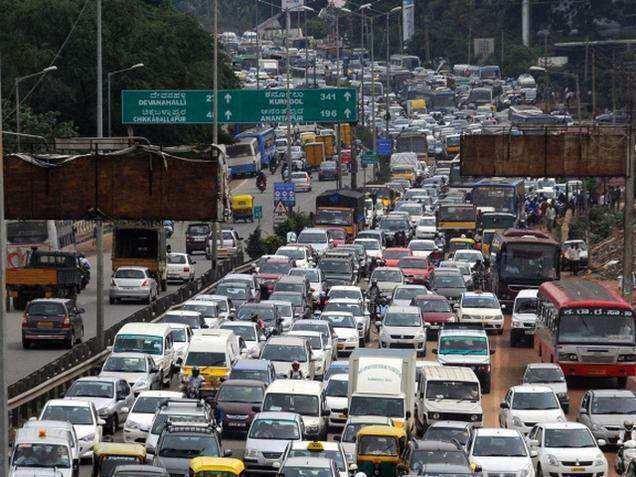 Indian cities can have CO from vehicle exhausts, burning coal and wood, furnaces and Diesel generators. It is hard to believe that ozone can be bad when we all know about the role it plays in shielding us from harmful UV rays. However Ground level or "bad" ozone is not emitted directly into the air. Bad ozone forms when pollutants emitted by sources such as cars, power plants, industrial boilers, refineries, and chemical plants react chemically in sunlight. ￼Breathing ozone can trigger variety of health problems, particularly for children, the elderly, and people of all ages who have lung diseases such as asthma. Ozone can aggravate asthma and even cause permanent lung damage. PM2.5 and PM2.5 refer to particles that are very small and you cannot see them with naked eye. Particles smaller than 10 micrometers in diameter can cause or aggravate a number of health problems and have been linked with illnesses and deaths from heart or lung disease. The reporting for particles is usually done in two ways. Better or more sophisticated instruments actually catch and weigh the particles of a particular size. The instrument will catch particles over a sampling period in a volume, weigh them and report the concentration as micrograms/cubic meter (Ug/m^3). Simple instruments report number of particles found in a particular volume. They don’t have the mechanism to actually weight the particles. That volume is usually reported in 0.01cf (0.01 cubic feet or 283 ml). So you will see reporting done as 2000/0.01cf or 283 ml. That means the instrument has detected 2000 particles below this particular size in a sampling period in 283ml volume. 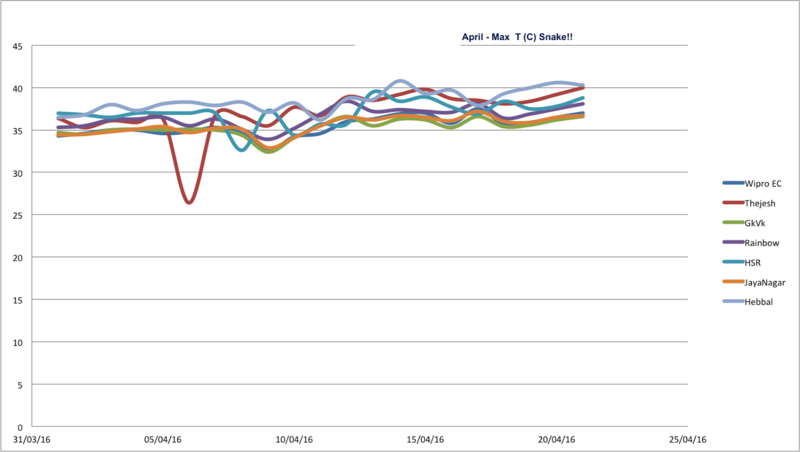 PM10, PM2.5, PM1 are not different things but 3 different metrics of the same aerosol population. The reasons for using one over the others are largely historic as there is loads more info on PM10 than there is on PM2.5 and on PM1 but these are all indicators and not in themselves the goal of any measurement. The smallest particles (those 2.5 micrometers or less in diameter) are called “fine” particles. These particles are so small they can be detected only with an electron microscope. Major sources of fine particles include motor vehicles, power plants, residential wood burning, forest fires, agricultural burning, some industrial processes, and other combustion processes. Particles between 2.5 and 10 micrometers in diameter are referred to as “coarse.” Sources of coarse particles include crushing or grinding operations, and dust stirred up by vehicles traveling on roads. NO2 is one of a group of highly reactive gasses known as "oxides of nitrogen," or "nitrogen oxides (NOx)." NO2 forms quickly from emissions from cars, trucks and buses, power plants, and off-road equipment In addition to contributing to the formation of ground- level ozone, and fine particle pollution. NO2 is linked with a number of adverse effects on the respiratory system. SO2 is one of a group of ￼highly reactive gasses known as “oxides of ￼sulphur.” The largest sources of ￼SO2 emissions are from fossil fuel ￼combustion at power plants (73%) and ￼other industrial facilities (20%). Smaller ￼sources of SO2 emissions include industrial ￼processes such as extracting metal from ￼ore, and the burning of high sulphur ￼containing fuels by locomotives, large ships, ￼and non-road equipment. SO2 is linked ￼with a number of adverse effects on the respiratory system. Ammonia is a colorless gas with a pungent odor that is noticeable at concentrations above 50 ppm. Most of the NH3 emitted is generated from livestock waste management and fertilizer production. Ammonia is poisonous if inhaled in great quantities and is irritating to the eyes, nose, and throat in lesser amounts. It combines in the atmosphere with sulphates and nitrates to form secondary fine particulate matter (PM2.5). PM2.5 is known to have harmful effects on human health and the environment. NH3 can also contribute to the nitrification and eutrophication of aquatic systems. Here gases are reported in parts per million (PPM) or parts per billion (PPB). There are different acceptable ranges for different gases, e.g. CO at 10 PPM is not hazardous but NO2 at 10 PPM is hazardous. Also, the numbers do not indicate whether the concentrations are hazardous or at moderate levels. AQI is concentration to number translation for a pollutant in the index. This is not a weighted or average index like a stock market index. That is why you have separate AQI number for every pollutant included in the index. AQI is “index” in the sense that you have an index of “pollutants”. 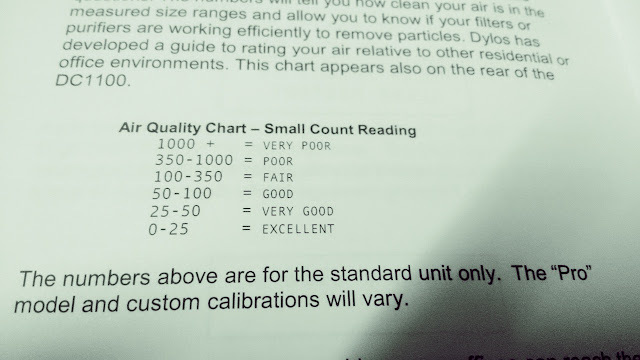 So at least in theory you can have safe AQI numbers for pollutant A and hazardous levels for pollutant B. Tomorrow it may as well happen that Government of India decides to create their own AQI index. They may as well say that in India, CO till 35 PPM is Level 1 and after 70 PPM is level 2 etc. Third part of this series will look at how to measure particles and gases. We will try to demystify the terms and jargons. 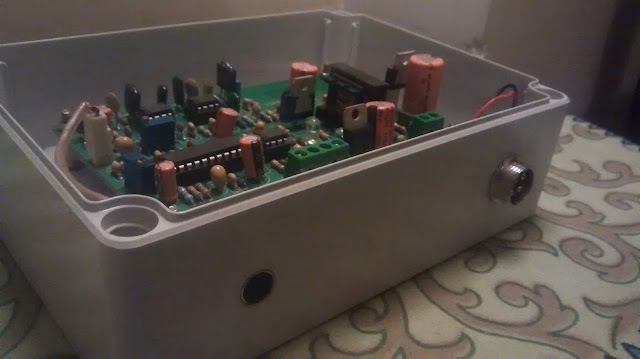 We will look at typical sensors deployed to measure particles and gases and what can be done to make a sensor cocktail on budget.